Emami, F., Mohammadzadeh Asl, B., Seydi, E., Zargar, M., Naserzadeh, P., Pourahmad Jaktaji, J. (2013). Embryo Toxic Effects of Atorvastatin on Mouse Fetus. Iranian Journal of Pharmaceutical Sciences, 9(1), 13-23. Farhad Emami; Baharak Mohammadzadeh Asl; Enayatollah Seydi; Mohammad Zargar; Parvaneh Naserzadeh; Jalal Pourahmad Jaktaji. "Embryo Toxic Effects of Atorvastatin on Mouse Fetus". 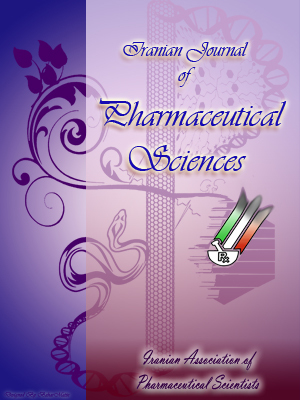 Iranian Journal of Pharmaceutical Sciences, 9, 1, 2013, 13-23. Emami, F., Mohammadzadeh Asl, B., Seydi, E., Zargar, M., Naserzadeh, P., Pourahmad Jaktaji, J. (2013). 'Embryo Toxic Effects of Atorvastatin on Mouse Fetus', Iranian Journal of Pharmaceutical Sciences, 9(1), pp. 13-23. Emami, F., Mohammadzadeh Asl, B., Seydi, E., Zargar, M., Naserzadeh, P., Pourahmad Jaktaji, J. Embryo Toxic Effects of Atorvastatin on Mouse Fetus. Iranian Journal of Pharmaceutical Sciences, 2013; 9(1): 13-23. 1Department of Pharmacology and Toxicology, Faculty of Pharmacy, Shahid Beheshti University of Medical Sciences, Tehran, Iran. International Branch, Shahid Beheshti University of Medical Sciences, Tehran, Iran. 2Department of Pharmacology and Toxicology, Faculty of Pharmacy, Shahid Beheshti University of Medical Sciences, Tehran, Iran. 3Islamic Azad University of Pharmaceutical Sciences,Tehran,Iran. Although the biokinetics, metabolism, and chemical toxicity of atorvastatin calcium are well known, until recently little attention was paid to the potential toxic effects of atorvastatin calcium on re-production and development in mammals. In recent years, it has been shown that atorvastatin calcium is a developmental toxicant when given orally or subcutaneously (SC) to mice. Decreased fertility, embryo/fetal toxicity including teratogenicity, and reduced growth of the offspring have been observed following atorvastatin calcium exposure at different gestation periods. On the other hand, an in vitro study using fetal isolated mitochondria nowadays has been recognized as a confident tool to evaluate the developmental toxicity of a number of chemicals. Although the developmental toxicity induced by atorvastatin has been investigated, the precise cellular mechanism of atorvastatin -induced embryo-toxicity has not been thoroughly recognized yet. For investigating the effects of atorvastatin calcium on pregnant animals, three groups (control, sham and test) of NMRI mice were chosen. In test group (50mg/kg,100mg/kg and 150mg/kg)of atorvastatin calcium were administered intraperitonealy at 11 day of gestation, in sham group only normal saline injected to interior peritoneum as indicated in the test group and in Control group which was considered as the comparison base line of our research, no injection was made. Caesarean sections were performed at 15 day of the gestation; and their placentas were examined externally. Based on our results atorvastatin calcium caused significant external anomalies, and caused a significant decrease (p<0.001) in the weight and diameter of placentas, the number of the embryos, their body weight and crown-rump length of fetuses.